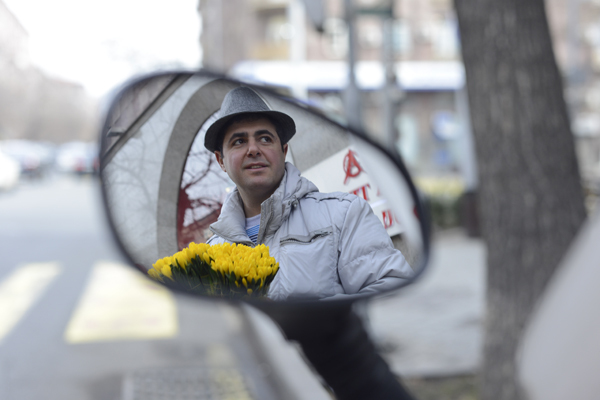 In the changing world, changing city, changing streets and shops, revolutions and the crossroad of human relationships, flower-seller Vardan and his smile have remained unchanged in the Nalbandyan‒Sayat-Nova crossroad for already 15 years. Independent of the thistly path that he has passed, hardships and the loss of his dear brother, he remained kind, hard-working, loving, giving smile and kindness ‒ Vardan of Roses (Vardan of Vards). 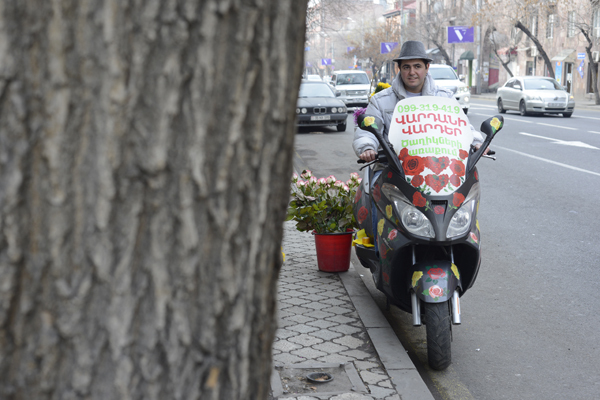 At the spot where Nalbandyan and Sayat-Nova street veins meet, the smiling Vardan transfers his spring mood year-round from his small motorcycle festooned with flowers. Vardan’s story is known to many. Once called New Karabala, he was later given the name Vardan of Vards by Yerevan dwellers. He didn’t yet turn thirteen when his mother’s illness and the task of feeding his sister and brother brought him to the street with the purpose to earn money. There was not a wide range of jobs; risks to fall under bad influences were big. The language of streets is simple, yet cruel. After doing different works, he finally opted for the job of selling flowers that was bringing beauty. 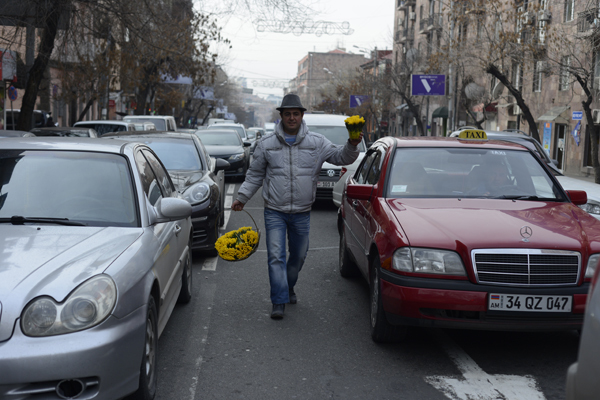 He had no place to keep the flowers: he kept them under this or that tree; there was no one to protect him: the police expelled him from the city center streets, warned him against the street trade, asked to keep away from the cars. Nevertheless, he wouldn’t listen: he would return to the street. One day an angry Special Service officer took him to Sovetashen (a dump) and threw away the whole box of the flowers. For only a moment, he hung his head. Then he found a car and asked to take him to the center. He promised to sell the flowers and pay the driver. The same officer saw him near the Opera and this time he got even angrier. He took him by his hand and lead to Valeri Osipyan (former Deputy Chief of Police, currently Chief of Police). The things were not going bad, kind people presented him with a bicycle. Now he rode around different places, but went on approaching cars standing under the red light and offering them to buy flowers. Then one of the drivers didn’t manage to break in time and… the broken flowers fell on the asphalt. Broken bones, brain concussion and a partial loss of memory until now. Yerevan dwellers and the police helped him again and he managed to overcome that and go back to his work. “God helps me, he loves me,” says Vardan smiling and presenting flowers and hears the answer, “God bless your children”. The advice of the police, his kindness at birth and God’s protecting hand kept him watchful and made him not to leave the right path. The child of the city always found his protection. The street became his school, his home and his friend. Currently he continues his favorite work in the crossroad of Nalbandyan and Sayat-Nova streets, this time with his bike, presented by the citizens. The residents of Nalbandyan Street have provided their cellars to Vardan not to keep the flowers under trees any more. The street gave him his profession, friends and…love. On a flowery spring day, Vardan noticed her. The stranger immediately caught his attention. He hurried to sell the bouquet and turned his bicycle towards her. “Sorry, isn’t your name Erica?” said Vardan, not finding any other way to get acquainted with her. The first step was taken. He had to persuade her for a long time, though, to have a cup of coffee. They have been inseparable since that day. Diana doesn’t like flowers. Still she has gifted her flower-seller husband two flowers: Marcos and Ghukas. Now the family rents a small apartment. Vardan goes to work every day, earns money for daily bread and supports his mother and sister more or less. However, by glorifying God, smiling to strangers and grateful to the police, he is thankful for every day. And he still keeps his childhood dream in his heart ‒ to have many children ‒ that has appeared from nowhere and is going to come true soon. A nontraditional photo story about a legend: Do you believe it too? Despite the fact that the Armenians who are in love don’t ignore Saint Valentine’s Day, the Armenian Apostolic Church has a movable holiday of Saint Sargis ‒ the captain, who is considered the patron saint of loving couples.